I generally build pinewood derby cars that don’t look like real cars. 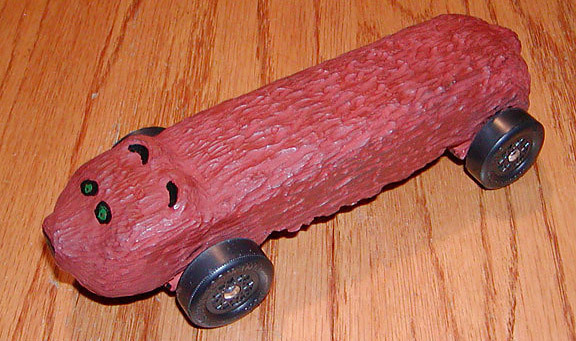 Oftentimes it is awkward to coerce a real car design into the pinewood derby car form factor. However, many people like to use a real car as the basis for a design, and in fact, I have done so a few times. So in this article I will explain how this conversion is accomplished, and the design decisions that will need to be made. Although I will focus on scaling up from a toy car, the same principles apply when scaling down from a full-size car. What Is The ‘Scale’ Of A Pinewood Derby Car? When building models, the ‘scale’ refers to the size of the model relative to the original. For example, many people have heard of “HO Scale”, a popular scale for model railroading. The HO scale is 1:87. That is, for every 1 inch in length (also width and height) of the model, the real train is 87 inches. Thus a train car that measures 44 feet long would be a little over 6 inches long in HO scale (44 feet, times 12 inches per foot, divided by 87). Pinewood Derby Cars do not have a specific scale factor, as they are forced to be 7 inches long by 1-3/4 inches wide (instead of varying in size based on the size of the original). 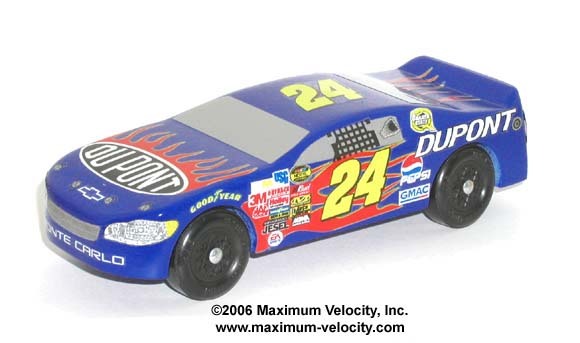 For many standard automobile sizes, 1:24 is pretty close, and in fact 1:24 scale decals generally work pretty well. However, the scale would be reduced when modeling a compact car, while the scale would be increased when modeling a large vehicle. So, instead of using a specific scale the designer must calculate a scale factor for the given original. To determine the scale, measure the length of the original vehicle, and then divide that number into 7 (inches). For example, let’s consider modeling a toy car that measures 3 inches long, 3/4 of an inch wide (excluding wheel wells), and 11/16 of an inch tall (see Figure 1). With these measurements, dividing the length (3) into 7 gives 2.33.1 Thus, for every 1 inch dimension of the toy car, the pinewood derby car will be 2.33 inches. Therefore, the pinewood derby car will be 7 inches long (2.33 times 3), 1-3/4 inches wide (2.33 times 3/4), and 1.6 inches tall (2.33 times 11/16). All other dimensions, such as the placement of the cockpit and engine, the location of the body curves, etc. are calculated using the same scale factor. At this point, a tradeoff may need to be made. In this case, the width is fine, however, 1.6 inches is quite tall for a pinewood derby car. If realism is the primary goal, then maintaining the 1.6 inches is okay. However, if speed is the primary goal, then it is best to reduce the height of the car as much as possible. Arbitrarily reduce the width to 1-3/4 inches, slightly skewing the final car. Recalculate the scale factor based on the width instead of the length. This will result in a pinewood derby car that is shorter than 7 inches; however, the proportions of the toy car would be maintained. The next design issue that must be resolved is the wheelbase. When the wheelbase of the toy car is scaled up, almost certainly it will not match the wheelbase required by your local rules. For example, on the toy car in Figure 1, using the 2.33 scale factor, the front wheels would be 0.73 inch from the front of the car, and 1.16 inches from the rear of the car. Obviously this does not match the BSA wheelbase (nor any other for that matter). At this point, the following options could be implemented (based on the rules for your race). If your race rules require a wheelbase distance AND a wheelbase position, then adjust the wheelbase to meet the regulations. This will certainly skew the resulting car, but there isn’t really a choice in this case. If your race rules require a wheelbase distance, but does not require a relative location then adjust the wheelbase to meet the required distance, but position the resulting wheelbase as close as possible to the position calculated with the scale factor. The resulting car will be skewed, but less so than in option 1. If your race rules do not specify a wheelbase, then use the wheelbase calculated with the scale factor. Another design issue is that of wheel wells. Many toy cars have wheel wells, so to accurately model the car the wheel wells must be included. This will require the addition of material to the sides of the car, followed by shaping the wheel wells to accommodate the pinewood derby wheels. But wait; now we may have another issue. Measure the diameter of the wheels on the toy car, and then multiply the diameter by the scaling factor. Does the result closely match the diameter of a pinewood derby wheel? If not, the wheel wells will need to be adjusted to fit the pinewood derby wheels, which could skew the car. As an example, for the car in Figure 2 (which also has a 2.33 scale factor), the rear wheels scale up to 1.16, but the front wheels scale up to 1.02. Since the standard BSA Speed is about 1.18, the wheel wells (mainly the front wheel wells) would need to be increased in size to accommodate the pinewood derby wheels. 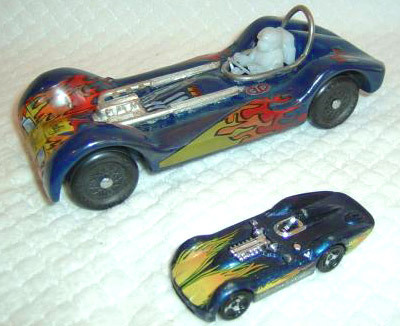 Given the rules for the local race, when the toy car is made to fit within the required dimensions, will it maintain the look of the original toy? With strict wheelbase rules, try to find a toy car that will fit well within the local wheel base restrictions. If you don’t want to deal with wheel wells, choose a car without them. Make sure to consider car weighting. You will likely need to add 2 to 3 ounces of weight, so space must be available on the car to accommodate the weight. Some toy cars are quite complex. Consider whether the car can be built with your tools, or whether the design can be simplified without sacrificing the original look. Actually, if you have a young boy like mine, the most difficult problem will be finding a toy car that is still intact! The Humvee in Figure 3 was modeled from a drawing on the internet. To model the wheelbase as accurately as possible, and to meet the BSA wheelbase specification, the car was shortened to 6.2 inches (see Figure 4 – blue lines show original body location, red lines show shortened location). The result is a wheelbase that matches the BSA wheelbase length, but is moved slightly forward from the standard location. The body is made from three parts (you can see the glue lines running front to back). Before the parts were glued together, much of the middle part was cut away to eliminate weight. Even so, the final car required little to no added weight. 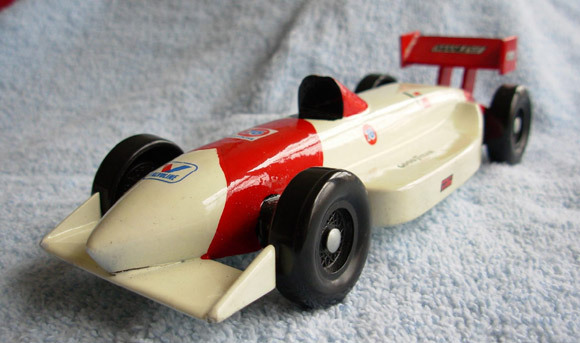 This race car was modeled by a customer (see Figure 5). As you can see, the wheelbase was lengthened, the wheel wells were enlarged, but the general look was maintained. This (unfinished) Stock Car body is for sale on our web site. The wheel base is lengthened to match the BSA wheelbase, but is offset to maintain the NASCAR look. The height of the car is slightly lowered (looks slightly mashed, but not overly so). 1:24 scale decals are used, but they had to be trimmed slightly as the actual scale factor is slightly larger than 1:24. If you need inspiration for a pinewood derby car design, your child’s toy box (or the local toy store) can provide a lot of great ideas. Then, by calculating a scale factor, creating a pinewood derby car from the toy car is not as hard as it may first appear. Just make sure to consider the overall dimensions, the wheelbase, wheel wells, and the overall complexity of the design before making any sawdust. 1Most ‘Hot Wheels’ brand cars are 3 inches long, resulting in a 2.33 scale factor. This is my wife’s car (Heidi). Named appropriately “Bear-ly Finished”. She was up until 2 AM the morning of the race! The car is hand-chiseled with Exacto blades and Dremel bits. I lubed the wheels and aligned them (Max V Official BSA Matched Speed Wheels & Axles). Because we were running late I only spent about 3 to 4 minutes on the wheels. Despite the lack of time they ran straight as an arrow, and the car was the second fastest of all cars participating. This car goes totally against all reasoning of physics! The COG is 21/4 inches(!!!) in front of the rear axle and only weighed in at 4.90 ounces! This car was never raced, it was just made for show. It was constructed from a standard BSA kit. The wings are made from tongue depressors and popsicle sticks, and the side pods from 3/8 inch thick pine. My son and I are open-wheel (Champ Car) race fans and I believe that this car was modeled after a car that Michael Andretti was racing circa early 90’s. We continue to get together for Champ Car races. 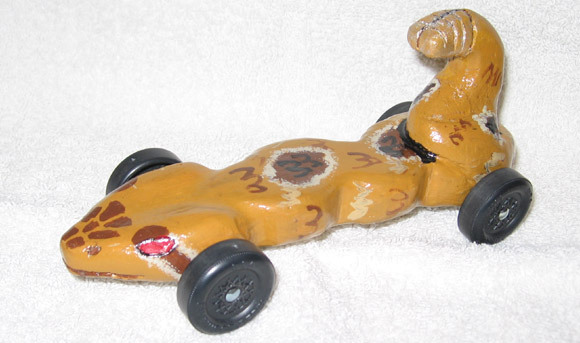 Attached is a picture of my son’s Pinewood Derby car from this year. He has won two first place overall trophies with a Wedge and the Formula 1 from your car plans. This year he wanted the Most Creative trophy, so we purchased the Extreme Car Plans booklet and attempted the Rollin’ Rattler. This is his version; I helped with the Dremel work and wheel polishing and he mixed the paint to get the right colors. He did take home the most creative trophy and came in 6th overall. My son Connor is now a Bear Cub. When he was a Tiger Cub he won for most unique. I also thought he had a fast car. Since then he has been bitten by this bug and has gone for unique designs instead of speed. Last year he made a ‘Tank’ which was pretty cool. It didn’t win anything, but he still enjoyed building and racing the car. This year I decided that no matter which car he built, it would also be fast! He again came up with a unique design: a tombstone. He carved it and painted it to look really nice with a stone paint finish. I had some leftover tungsten weights from building a car for the adult race, so we used them in Connor’s car. I think these tungsten weights made a difference because of their density and small size. I was able to create a small hole to put them in (over the rear wheels). Then I was able to carve out some wood underneath to make the 5.0 ounce limit. During the time trials the night before the derby we got excited. His car beat most that he went against. His time was also competitive with the adult cars. We had done something right! On the day of the big race he was very excited. We had a fast car and a unique car. Most of the other scouts liked Connor’s design. Everyone wanted to touch it and feel the stone finish. When the race started everyone, except me, was surprised that this ‘rock’ was so fast ! It was not aerodynamic at all. It did not look fast, but it was. In his heats he had two first place finishes and two second place finishes. Connor was so thrilled just to win two heats that he would have been happy just with that. When they called the third place winner in speed, it was not Connor. I felt like he would at least get third. “What went wrong,” I thought. Next … “Second place in speed goes to … CONNOR.” Yes, he won second place in speed! WE ARE GOING ON TO THE DISTRICTS RACE IN MARCH! I think the speed of the car has a lot to do with the tungsten weights we got from you and where we placed them. I recommended these weights highly! Another question for you. My son is interested in lightening his BSA wheels in order to maximize weight placement back. We can get them down to about 1.5 grams. With the mass loss, does the 20 to 30 second spin rule still apply? The reason I ask is that we have lost a couple of seconds off the wheel spin time. As the weight of the wheel is reduced, the spin time of the wheel will be reduced accordingly. The momentum of the wheel is what keeps the wheel spinning, and momentum is based on the weight of the wheel and the velocity of the spin. If my son’s car wins and goes on to the next level, before the next race we want to re-lubricate the wheels. We put two drops of white glue in each axle slot to hold the axles in place. How can we pull the wheels and axles out of the slots without damaging anything? With white glue, you should be able to grasp the axle head with a pair of pliers, then gently twist and pull the axle out. The glue bond should release when you give the axle a slight twist. After removing the axles, clean out most of the glue from the slot, then re-glue after you re-install. We have a car body with drilled axle holes, and one front wheel is drilled higher. What is the best way to make all four wheels touch the ground? First, verify that the rules for your race do require four wheels touching. If you don’t need four wheels touching, then I would leave the car as is (better performance). To get four wheels touching, there are two options. Plug both front axles holes with round toothpicks, then re-drill the front two holes with a drill press, or with the Pro-Body Tool. A #44 or #43 bit is required. Don’t try to just plug one hole and re-drill. It is extremely difficult to drill a new hole that matches the others. Plug both front axle holes with round toothpicks. Then use a saw to cut a slot at the front axle position. A radial arm, or table saw work best. Just make sure that the width of the blade is the correct size (test this on a scrap piece of wood). In a pinch, you can use a band saw or hand saw, but these tools are not as accurate.